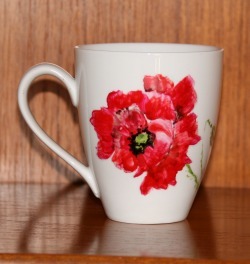 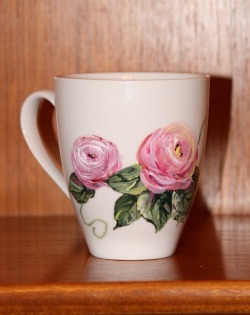 All the crockery is hand painted onto fine bone china/porcelain, unless otherwise stated. 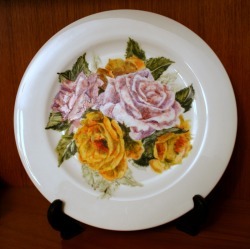 The paint used is made to be used on glass or porcelain and is baked in a domestic oven to set the design. 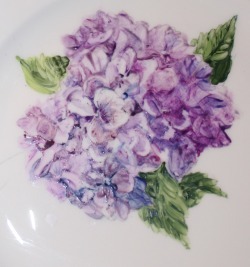 Once baked they can be washed in the top shelf of a dishwasher, but hand washing is recommended. 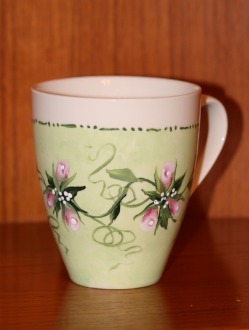 As with all hand painted products no two designs will be exactly the same, but if a design is requested it will be reproduced as near as possible to the original design. 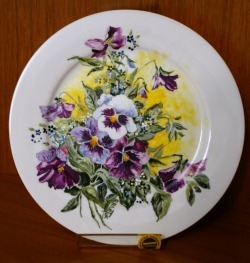 Detail pansies on white porcelain plate. 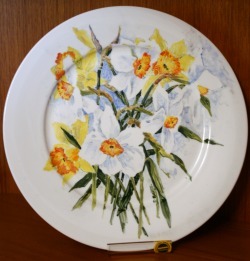 Narcissi hand painted onto a white porcelain plate 10.5" (27cm) diameter. 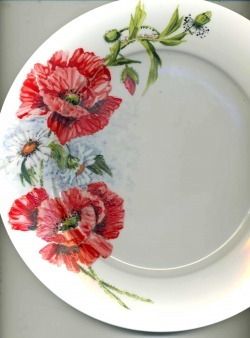 Detail - Poppies and daisies on white porcelain plate 10.5" (27cm) diameter. 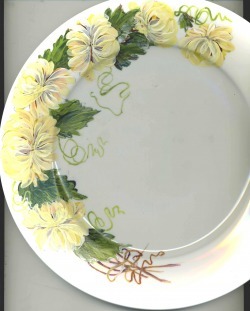 Detail - Chrysanthemums on white porcelain plate 10.5" (27cm.). 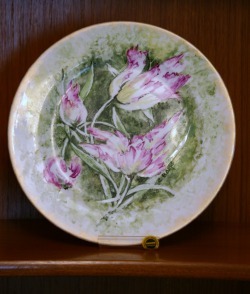 Tulip on white porcelain plate 10.5" (27cm). 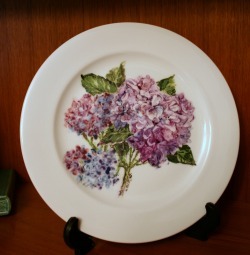 In private collection. 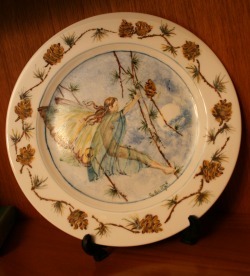 Hydranger on fine white china plate 10.5" (27cm). 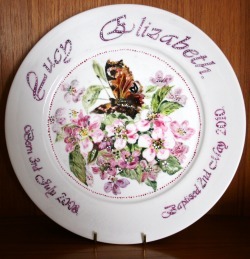 Butterfly on blossom, commissioned plate for her baptism. 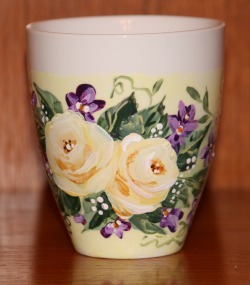 April 2010. 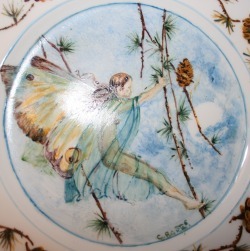 Swinging fairy on white porcelain plate 10.5" ( 27cm) Detail below. 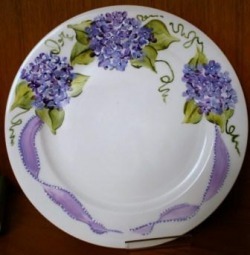 Hydranger place setting. 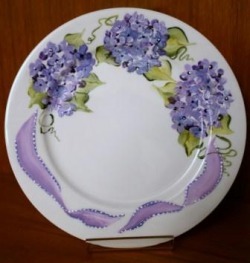 Design hand painted on white fine china plate. 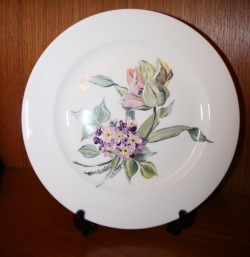 Hydranger, 10.5" 27cm diameter fine white chine dinner plate. 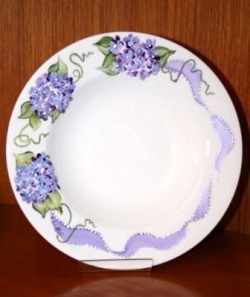 Hydranger side plate 10.5", (20cm) diameter hand painted on fine white china. 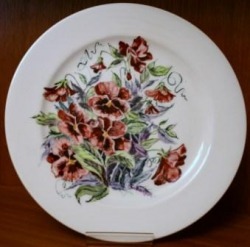 Hydranger soup bowl 10.5" (27cm) diameter. 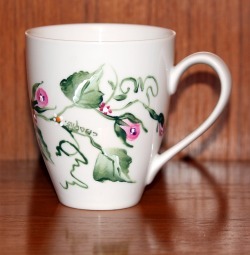 Hand painted on fine white china. 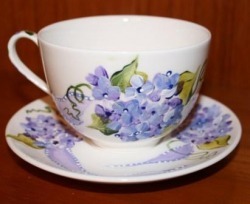 Hydranger cup and saucer, hand painted on fine white china. 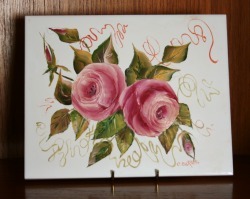 Pink roses painted in oils on a 8 x 10" white tile. 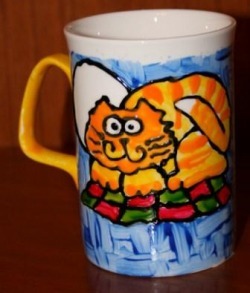 Cat on a hot rug mug. 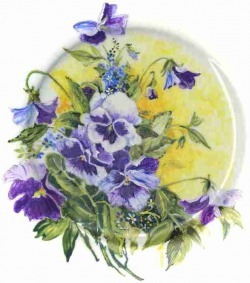 Inspiration from Paula Collins, Priscilla Hauser and Wendy Tait.